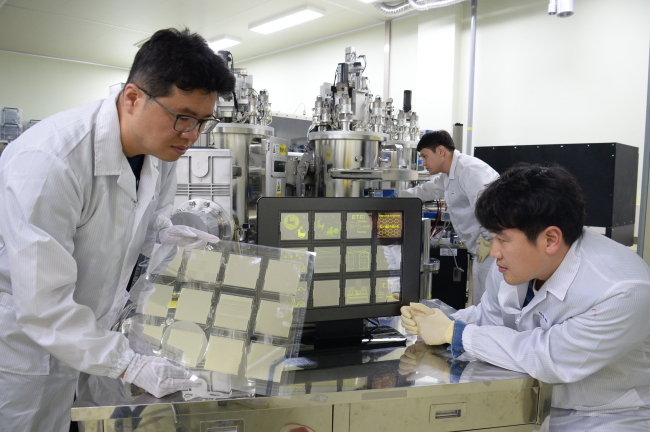 South Korea’s Electronics and Telecommunications Research Institute said Tuesday it has developed transparent electrodes for organic light-emitting diode displays out of graphene in cooperation with Hanwha Techwin. Graphene is considered the thinnest, most flexible and fastest in transferring heat and electricity among exiting materials. As display panels become thinner and lighter, ways to utilize graphene are being studied by many research groups. ETRI and Hanwha said their joint research team succeeded in using graphene to replace indium tin oxide, known as ITO, which has been widely used to make transparent electrodes in OLED panels. ITO is highly fragile, but graphene is flexible and resistant to chipping. The team used graphene on the largest OLED panel on earth, which is 370 millimeters in length and 470 mm in width. The thickness of the team’s graphene electrode was less than 5 nanometers. They also developed a process for patterning graphene-based transparent electrodes with specific numbers and shapes on the OLED substrates, which could be applied for developing flexible smart devices in the future. By using the new material, the commercialization of flexible OLED products can move forward, according to Cho Nam-sung, head of ETRI research team. ETRI began the research four years ago in support of the Ministry of Trade, Industry and Energy. In 2015, the researchers successfully developed a graphene-based OLED panel that is about the size of a coin and about 10 times bigger one last year. Their work was presented at Graphene Conference 2017 held in Barcelona last month. The team also plans to develop plastic OLED electrodes by next year, and aims to help commercialize flexible and fordable OLED panels in five years. The display industry welcomed the news, hoping for wider use of the cutting-edge material in producing completely fordable display panels. LG Display, a leading OLED panel manufacturer, is currently working on development of fordable display panels. The company introduced what it calls a “rollable” OLED panel, referring to a panel that can be rolled up as toilet paper, at the Consumer Electronics Show in January.